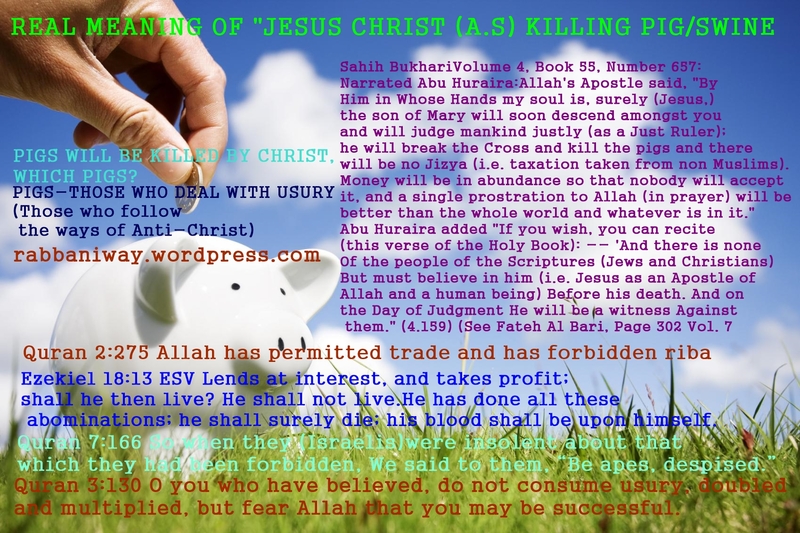 What is the meaning of the Hadith ” Jesus Christ will kill pigs? 3:130 O you who have believed, do not consume usury, doubled and multiplied, but fear Allah that you may be successful. So many Mosques and Islamic institutions hve account with riba institutions! According to Islam, it is not allowed! We must wake up now! Muslim groups that claim they are guided and the correct sect that is mentioned in Hadith, they are dealing with such institutions which deal with riba accounts! Such institutions are illegitimate according to Quran! Quran 9:108 Do not stand [for prayer] within it – ever. A mosque founded on righteousness from the first day is more worthy for you to stand in. Within it are men who love to purify themselves; and Allah loves those who purify themselves. 9:109 Then is one who laid the foundation of his building on righteousness [with fear] from Allah and [seeking] His approval better or one who laid the foundation of his building on the edge of a bank about to collapse, so it collapsed with him into the fire of Hell? And Allah does not guide the wrongdoing people. 9:110 Their building which they built will not cease to be a [cause of] skepticism in their hearts until their hearts are stopped. And Allah is Knowing and Wise. So do you think that such Mosques and Islamic centers you built on a riba terms and conditions included bank account will stand up when the Son of Mary comes? It is clear that all lawless institutions will be broken down!! so do not wonder, if Allah turn your enemy against you and cause him to destroy your buildings!,(a hadith about end of times says so), or Mehdi and Messiah comes and break everything that is built on heresy and lawlessness! Deuteronomy 23:19-20 ESV “You shall not charge interest on loans to your brother, interest on money, interest on food, interest on anything that is lent for interest. You may charge a foreigner interest, but you may not charge your brother interest, that the Lord your God may bless you in all that you undertake in the land that you are entering to take possession of it. Ezekiel 18:13 ESV Lends at interest, and takes profit; shall he then live? He shall not live. He has done all these abominations; he shall surely die; his blood shall be upon himself. Ezekiel 22:12 ESV In you they take bribes to shed blood; you take interest and profit and make gain of your neighbors by extortion; but me you have forgotten, declares the Lord God. Leviticus 25:37 ESV You shall not lend him your money at interest, nor give him your food for profit. Psalm 15:5 ESV Who does not put out his money at interest and does not take a bribe against the innocent. He who does these things shall never be moved. Isaiah 1:1-31 ESVThe vision of Isaiah the son of Amoz, which he saw concerning Judah and Jerusalem in the days of Uzziah, Jotham, Ahaz, and Hezekiah, kings of Judah. Hear, O heavens, and give ear, O earth; for the Lord has spoken: “Children have I reared and brought up, but they have rebelled against me. The ox knows its owner, and the donkey its master’s crib, but Israel does not know, my people do not understand.” Ah, sinful nation, a people laden with iniquity, offspring of evildoers, children who deal corruptly! They have forsaken the Lord, they have despised the Holy One of Israel, they are utterly estranged. Why will you still be struck down? Why will you continue to rebel? The whole head is sick, and the whole heart faint.